Just like our clothes, carpets also need to be regularly cleaned to keep them fresh and clean. Accumulated grit and debris are one of the major causes that reduce the life of your carpet, so it has to be cleaned regularly. Not only this, dirty carpets can also become a breeding ground for harmful mites and bacteria, which can cause or exacerbate existing health issues. Before you consider replacing your carpet or medical health bills that you or your family may face, why not consider regular cleaning too? Most of us realize that the dirt we see on a carpet is only a fraction of the amount contained within. It really is the tip of the iceberg so to speak and around 85% of the remaining dirt and debris lies deep within the carpet fibers. What’s more, when you consider that a carpet can easily carry it’s own weight in dust and bacteria, it could be harbouring as much as 65kgs of debris for an average sized living room. No. Regular vacuuming will remove the top layer of dirt, but it won’t reach the areas deep down the carpet fibres. The trick is to keep your carpet regularly vacuumed from day 1 before any dirt gets time to penetrate. The trouble is that aside from being harmful, carpet debris can actually cause damage to your carpet. Every time your carpet is walked on, the dirt gets further compacted into the fibres. As it does so, it acts like sandpaper as it rubs away at the carpet strands causing damage. In contrast, regular professional carpet cleaning ensures the elimination of mites, bacteria and deep-down debris that lingers within your carpet. It also ensures elimination of the most stubborn of stains and leads to a deep-down clean and hygienic environment. 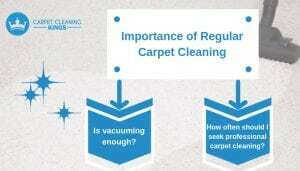 So how often should I seek professional carpet cleaning? That all depends on the amount of use your carpet gets. 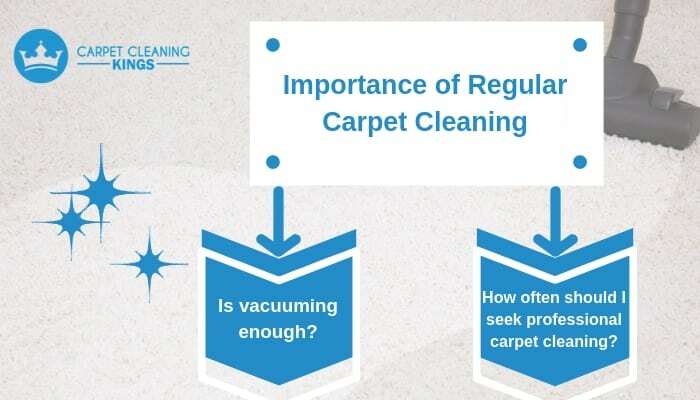 For example, for high traffic use, such as those carpets located in hotels or business premises, you might want to look at professional carpet cleaning every three months. Whereas for your typical family with 2.4 children, professional cleaning once a year along with regular weekly vacuuming, is best in order to prolong the life of your carpet. If you feel it’s about time you showed a little love to your carpet and give it a clean, then contact Carpet Cleaning Kings. We’ve been cleaning the carpets in the Brisbane areas for many years. As such we have the experience and the skills to have your carpet looking and smelling incredible. For a no obligation carpet cleaning quote, give us a call on 1300 7000 75 today. Isn’t It Time You Had Your Aircon System Cleaned?